What does summer make you think of? Personally, this time of year always makes me miss being a kid. Remember those beautiful summer days spent at the beach building sandcastles? How about vegetables from mom’s garden, or chasing fireflies at sunset? Summer is the best! We’ve got a fantastic dessert recipe for you today, and the reason it’s one of my favorites is because it reminds me of the summers I spent with my Grandma. Whenever I came to visit, she always had my favorite snack waiting for me: a cool orange cream pop! She always knew how to make my visits extra special, and this delicious dessert was the perfect finishing touch. So, in honor of summertime, and my Grandma, we’ve got an easy poke cake recipe to bring back those fun-in-the-sun flavors from childhood. 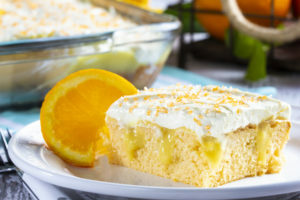 Get ready to enjoy our delicious Orange Cream Poke Cake! After turning on your oven, so it can preheat to 350 degrees F, you’ll need to gather your ingredients! 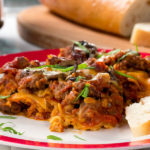 This recipe has an interesting mix of special ingredients. 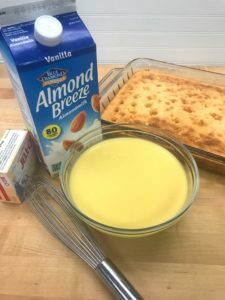 When I first saw the recipe, I wondered how ingredients that were so different could come together to make this creamy summer treat. 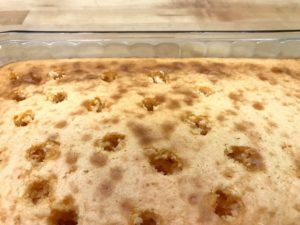 But trust me, the payoff of this easy poke cake recipe is worth it if you want something unique and extra tasty! 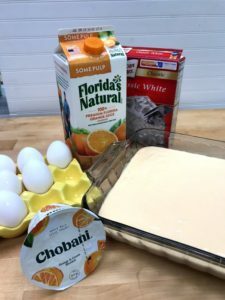 To get started, you need basic white cake mix, 1 cup orange juice (I’m a Florida girl, so you know I’m using Florida’s Natural), a 5.3-ounce container of orange & cream yogurt, and three eggs. While the oven is heating up, take a second to coat a 9- x 13-inch baking dish with cooking spray. Then, use an electric mixer to beat the cake mix, orange juice, yogurt, and eggs together in a large bowl. Once that’s done, pour this cake batter into our baking dish. 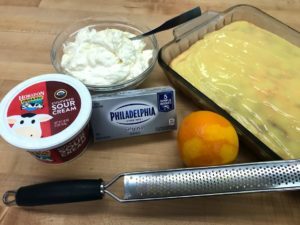 Using the orange juice and orange & cream yogurt gives your basic white cake mix the perfect hint of citrus! Plus, the yogurt means this cake is going to be perfectly moist. The batter for our poke cake recipe is going to be a soft white, with just a hint of orange. Trust me, it’s going to taste just as smooth and creamy as it looks. My Grandma would be so proud, and we haven’t even put this baby in the oven! Next comes the baking. Bake your cake for 30 to 32 minutes, and enjoy the summery smells filling your kitchen. You’ll know the cake is done when you can insert a toothpick into the center and pull it out clean. The next step in the recipe works best if the cake isn’t piping hot, so once it’s done let the cake cool for about 20 minutes. Once the cake is cool, use the handle of a wooden spoon to poke about 20 holes in the top of the cake. Scatter them as evenly as possible to make sure each slice of this poke cake recipe is filled with creamy goodness! After you’ve poked your poke cake, set it aside for a bit. Now, we’re going to make the “poke” part of our poke cake! That means the creamy filling that gets drizzled into the holes. For this we’ll need a package of instant vanilla pudding mix, and 1-1/4 cup of delicious vanilla almond milk. In a medium bowl, whisk these together until the mixture thickens slightly. Then you’ll slowly pour your poke cake mixture into the holes of your cake. Once the entire bowl of your poke mix is on top of the cake, you’ll want to make sure it’s spread nice and evenly over the top. Then we’re going to pop this in the fridge and let it chill for about an hour. While your poke cake is chilling, we want to whip up our frosting! This part doesn’t take very long, so you can wait to start this step till there’s about fifteen minutes left in your chill time. 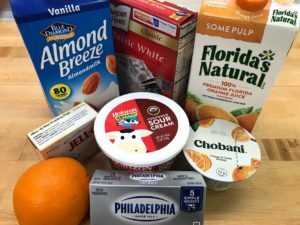 For this step, you’ll need 1 (8-ounce) package of cream cheese, 1 (8-ounce) container of frozen whipped topping that you’ve thawed beforehand. You’ll also need 1/2 cup of sour cream, and 1 teaspoon of vanilla extract. In a large bowl, use your electric mixer to beat the cream cheese until smooth. Then add your confectioners’ sugar, whipped topping, and the vanilla, making sure to mix everything well. 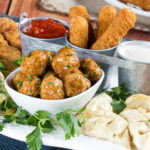 Who knew a few ingredients from your local dairy aisle could inspire something so delicious? To finish off this frosting, using a zester, we’re going to zest half an orange, and add that into our frosting mixture for a little something extra. My Grandma always enjoyed a bit of zest, and I’m sure your family will too! Dollop your frosting on top of your poke cake, and then gently spread it into an even layer over the pudding. 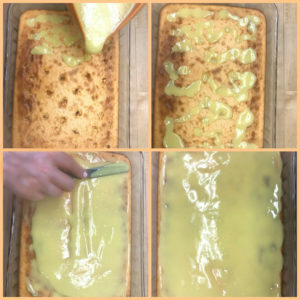 Once the frosting is perfect, you’ll want to chill your poke cake for another two hours, or until you’re ready to serve! Right before I bring it to the table, I like to garnish it with some orange sugar sprinkles to add a pop of color. You’ve got an easy poke cake recipe that everyone is going to want to try this summer. The sweet orange and cream flavor of this cake will be a hit at your next potluck, backyard party, or casual family get-together. I hope this dessert fills your summer with sweetness and thanks for taking a trip down memory lane with me. Can I ask a favor? When you make this poke cake, will you please save two slices? One for me, and a big one for my Grandma! This conversation is sponsored by National Frozen & Refrigerated Foods Association. The opinions and text are all my own. What recipe makes you think of summer? Sounds & looks delicious. However, Grandma didn’t use Almond Milk.